It feels like home with RJD Furniture. In this post I am giving you a look at RJD Summerhouse Plus, an open and modern house that lets the natural light in. You will feel right at home with this house that has all the space for you to add your preferred decorations. Not just that, but RJD Summerhouse also comes with its own furniture that also has animations and is texture change. 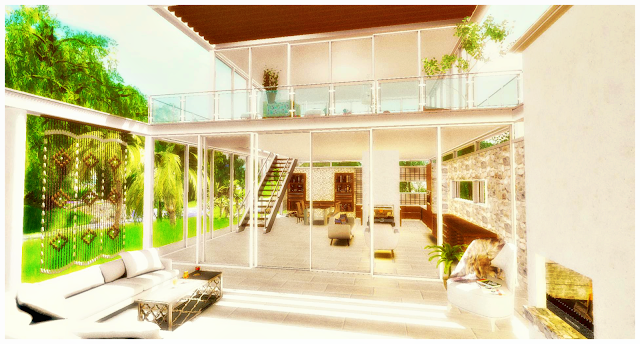 It comes with 4 versions: Summerhouse empty (47 prims), Summerhouse furnished (137 prims) and both version in mirror. Furniture includes kitchen, bar, walk-in shower, bath, bathroom sink and mirror, bed, sofa and armchair. All come with animations and textures can also be changed! One of my favorite features are the fireplace and the stairs, as they have a day and night version. Another is the moving drawers! This house has so many options and it is for sale at just 699L. Demo of the Summerhouse can be seen inworld at The Land Of Rainbows. ✉ RJD by RickJ Ewing: Marketplace ‖‖ Inworld ‖‖ Facebook ‖‖ Flickr ‖‖ Flickr Group ‖‖ RJD House demo's on Marketplace. - Trees: Little Branch by Cari McKeenan - BeachPalm + DracaenaTree. - Grass: Mindgarden Creations by Bonny Greenwood - Pandorian Dandelion Grass. - Couch: Chez Moi by Nanda Marjeta - New England. - Curtain: Soy by Soyoy - Wooden Beaded Curtain. - Table: Bazar by Ria Bazar - Morocco Side table. - Drinks: Poche by Miyu Adder - Omoide jun kissa Cold drinks set. - Planter: Di'Cor by Olga012 - Delia Wicker planter. - Chair/Blanket/Books: Di'Cor - Simone. - Plant: Plaaka by Zazie Daviau - Eucalyptus Polyanthemos. - Birdcage: DRD by Deathrowdesigns - 10. LN Birdcage light decor. - Vanity set: Peaches by Imaginerabbits - Impassioned. - Table setting: Mesh India by Karthikeyan Engineer - My cozy Night. - Poufs: Pewpew! by Ramadiez Carter - Leather Pouf. - Dog: Jian by Jiansl - Dashing Dalmations 9. Wander Pup Medium. - Console: Bigbully by Kai Mannequin - Julia. - Place setting/Rose vase: Your Dreams by Pietra Landar - Intimate Wedding. - Book decor: Krescendo by KrescendoStore - (5) Headphones Book Stopper. - Ottoman: Convair by Tobias Convair - Circular Sectional Sofa. - Book: Fapple by Giannaarmani - Crime and Punishment Book. - Notebooks: Reign by Kandee Cole - #12 Notebook and Day Planner.